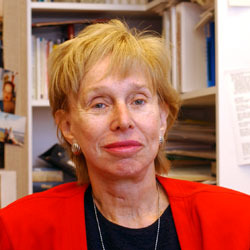 Dr. Judith Rapoport is an elected member of the Institute of Medicine and a Fellow of the American Academy of Arts and Sciences. Dr. Rapoport's laboratory investigates the clinical phenomenology, neurobiology and treatment of psychiatric disorders in children, including Childhood Onset Schizophrenia, Attention Deficit Hyperactivity Disorder and Obsessive Compulsive Disorder. Rapoport received her B.A. from Swarthmore College in 1955 and her M.D. from Harvard Medical School in 1959. She obtained her clinical and research training at the Massachusetts Mental Health Center in Boston, the Children's Hospital in Washington, D.C., and the Karolinska Hospital in Stockholm, Sweden.